Earth is surronded by a magnetic field. This magnetic field is similar to a dipole field generated by a bar magnet with a north and a south pole. The field lines converge (point vertically downward) at the north magnetic pole and emanate (point vertically upward) from the south magnetic pole. The imaginary bar magnet has an axis with a tilt of about 11 degrees compared to earth's axis of rotation and is offset from Earth's centre by about 550 kilometers. In reality the shape of the geomagnetic field is more complex than a bar magnet. The field is not completely dipolar and it changes (its rate of change changes as well) with both location and time. Therefore the magnetic poles are not located in the same place as the north and south geographic poles of the earth. The generation of such a magnetic field is explained by a dynamo process due to the movement of the fluid (molten iron) outer core of the earth. Occasionally there is a magnetic field reversal where the field switches polarity. In this video, Lisa Tauxe from the Scripps Institution of Oceanography discusses the nature and origin of the earth's magnetic field, measuring and mapping its strength, and tracking its variations. Earth magnetic field lines (magnetic meridians) or lines of force are vectors with direction and intensity. The magnetic field vector at each location is described by seven components: total intensity (F), vertical intensity (Z), horizontal intensity (H) with its north (X) and east (Y) components, inclination (I), and declination (D). Maps of the magnetic elements and their secular variation based on the World Magnetic Model (WMM 2010) are avaible from NOAA: http://www.ngdc.noaa.gov/geomag/WMM/image.shtml. Due to its irregularity and ever-changing nature, the earth's magnetic field needs to be constantly measured (by sattelite and worldwide observatories) in order to get an accurate picture of its distribution and changes over time. Based on such observations, magnetic field reference models are developed to describe the magnetic field and its changes in the future. Two main worldwide models are the International Geomagnetic Reference Field (IGRF) and The World Magnetic Model (WMM). The Canadian Geomagnetic Reference Field (CGRF) is a regional model specific to the magnetic field over Canada and its surroundings. A magnetic field calculator based on a specific model can be used to calculate different elements of the magnetic field for a desired location and time. Examples include a calculator based on IGRF model, a calculator based on CGRF and IGRF models and a calculator based on the WMM model. Using the dipole analogy, the magnetic poles are defined as areas where dip or inclination (I) is vertical and horizontal intensity (H) is zero. Magnetic meridians enter the earth vertically at the magnetic north pole and leave the earth vertically at the magnetic south pole. Magnetic poles experience long-term movement or secular variation, diurnal movement, as well as more rapid shift and variations due to magnetic activities originating from the sun such as magnetic storms. 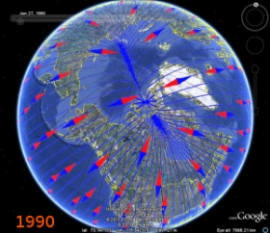 As mentioned above, the dipole analogy is a simplified description of the earth's magnetic field which is a good approximation for up to 90% of the real field. The real magnetic field however is different than the dipole field and this difference is particlulary pronounced near the magnetic poles. Check Geological Survey of Canada Geomagnetism tutorial for an explanation of this difference. In this video Charlie Barton discusses the magnetic poles, their location and movement. You can also find animations of changes through time of the horizontal direction of magnetic field, orientation of magnetic compass, and declination contours in the CIRES Geomag Consortium: http://geomag.org/info/declination.html and NOAA Science on a Sphere (SOS): http://www.sos.noaa.gov/Datasets/dataset.php?id=116 websites; magnetic pole movement is evident in these animations. The images below show the compass needles overlayed on magnetic field lines (horizontal component) in Google Earth for years 1900, 1990 and 2010. 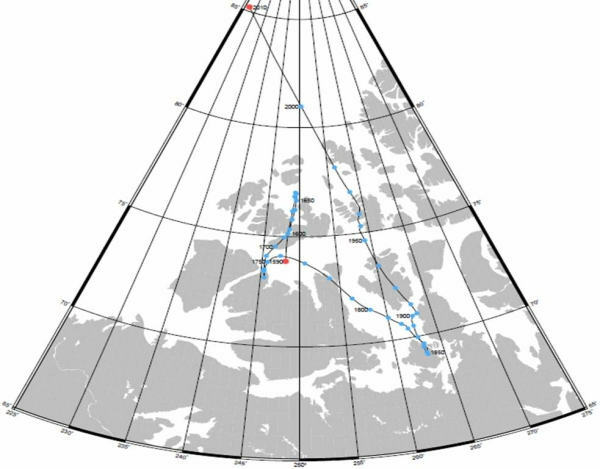 Movement of the magnetic north pole (blue star) is clearly evident throughout the years. Also note how the compass needles line up with the magnetic field lines. The compass needle does not point toward geographic north pole nor does it point directly toward magnetic north pole. The angle between true north (the line towards geographical north pole) and the direction towards which the compass needle points is called magnetic declination. Again it is evident how the compass needle direction and consequently magnetic declination changes with location and time. 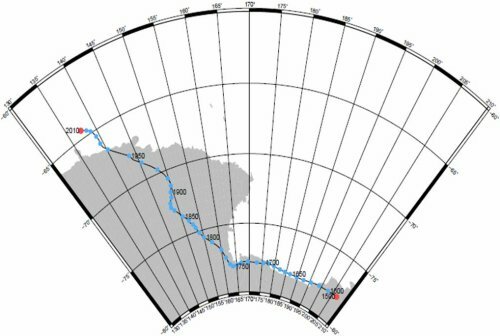 More on magnetic declination in the next section.